It's almost summer time and the beach has come alive with all kinds of activities. So much fun in the sun and today's project sort of depicts all that. I love this cute little Framed Chalkboard Art made with Chalk Couture's "Enjoy the Journey" transfer and Chalkology Pastes. It's quite simple to do with the layering technique and in no time I had a really cute piece of summer fun artwork for our wall. I am also joining with several other bloggers to show you just how versatile this transfer is. At the end of this post, you will find several links to visit that will give you different ideas of how you can use it in your decor. I think you'll find it's a simple and easy technique that can be done in no time at all. 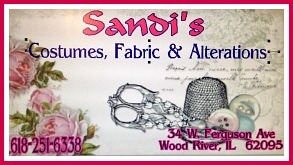 You can find all the Chalk Couture supplies in my shop. This is the "Enjoy the Journey" transfer that Chalk Couture released for the May Club Couture. As you can see it has everything you need to make your own cute bicycle art. 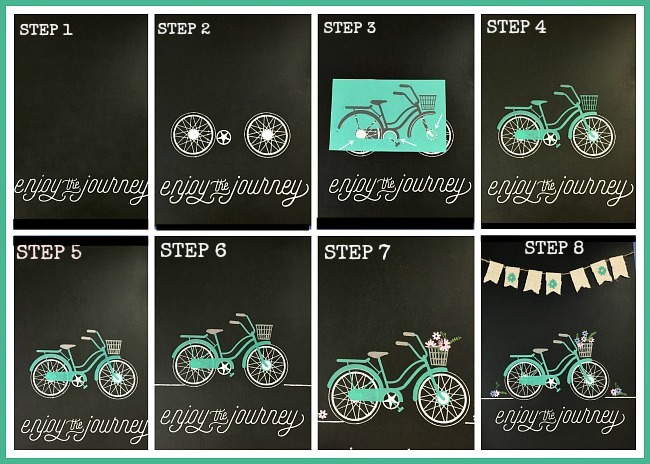 Below I am going to take you through the steps one-by-one to show you how you can make your own chalkboard bike. 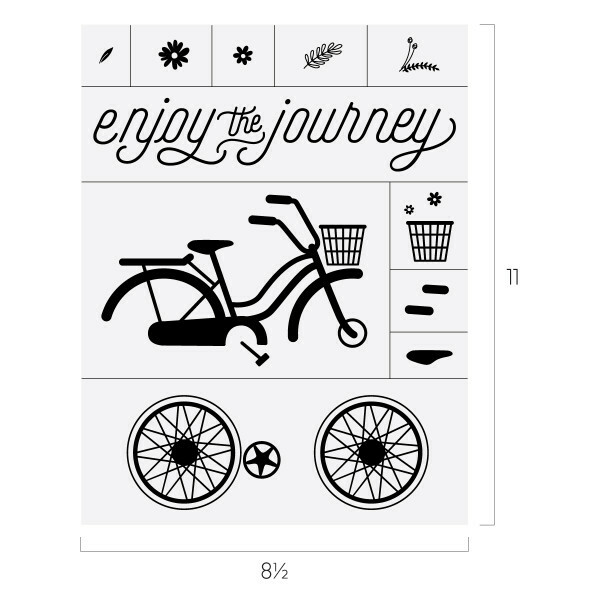 Step 2: Place the section with the wheels on it above the words. Center them with the wheel with the star circle next to it on the left side of your board. Using the white paste, paste this section also. Then dry it naturally or with a hairdryer. Step 3 and 4: Now place the main part of the bike over the wheels aligning the middle circles of the wheels. This is not difficult as you can see through the screen print easily. (I have placed some arrows showing what areas to align.} Using Tai Teal paste this part of the art - then let it dry or use the dryer. It will look like the fourth image when done. Step 5: Place the pieces with the basket, the bike seat, and the handlebar grips over the corresponding parts on the bike. Using Elephant Grey paste these parts of the transfer. Then dry it. Step 6: On this step, I actually used a straight line from another transfer - you can use any you have. (You could also place two pieces of painters tape down and then chalk between them.) I used the white paste to make this section. Then let it dry. Step 7: Now we're going to start adding the cute little flowers. First, I used the fern looking section and placed it in different areas using Evergreen paste to make leaves and grass. Then let them dry. Next, I added the flowers using the Bubblegum Pink and the Periwinkle pastes. I randomly placed the large and small flowers in areas I thought were pleasing to the eye. You can add as many as you like. 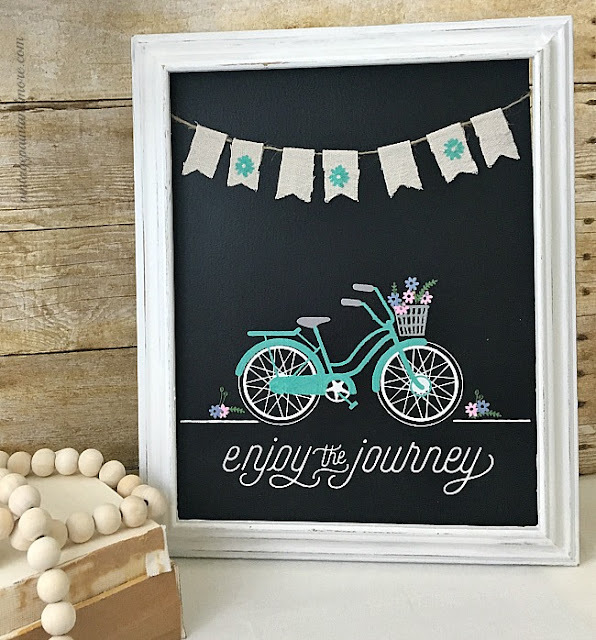 Step 8: This step is totally optional but I love adding embellishments to my chalk art. I cut some strips of drop cloth into little flags. Using the large flower I chalked a large flower on three of the flags with the Tai Teal. I then hot glued these flags on to a length of twine which I glued to the board itself. I think it just adds that extra touch of cuteness I love. I then placed the board in a thrift store frame that I had painted white and distressed with a piece of sandpaper. I love it - such a cute little piece of art for the summer. And... did I tell you I am totally infatuated with bikes right now... A perfect transfer for me. Thank you for joining me today and don't forget to check out the links below to see what the other bloggers have done with their transfer - I know you're going to love each and every one of them. Want to learn more about Chalk Couture and all the great projects you can make? Join my Facebook Group - Chalking with Cathy. 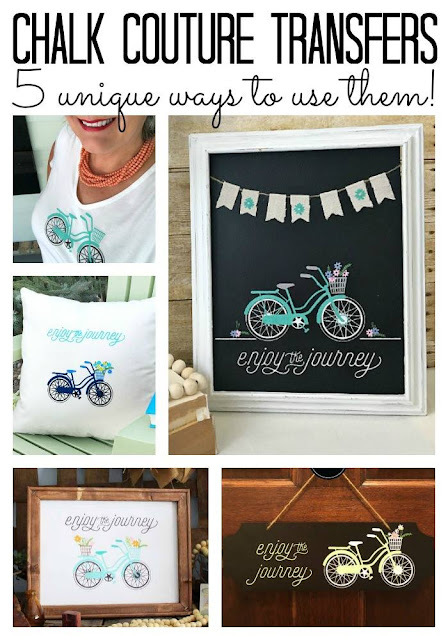 I am an independent designer for Chalk Couture and will be sharing tips, techniques, projects, and how-to videos using all the wonderful Chalk Couture products. Want to make sure you don't miss anything? Be sure to sign up for my emails in the box at the top of the page. I will be joining the great link parties that are listed on Where I Party page. 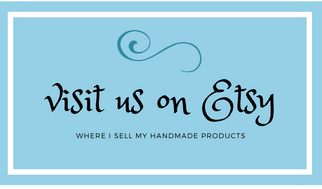 Be sure to visit each one you will find all kinds of wonderful projects and inspiration. Very cute! I'm not very good with transfers, but I love the look of this sign. Thanks so much for sharing at the #happynowlinkup! This is adorable and you did such a great job. Just Love those lil bicycle pictures for some reason. Guess cause they are so cute and whimsical.